lol it seems like everyone saw him dragon zakura first. he's irrestable there. who wouldn't love him. I first saw him on WaT PV.. But never bother to know who he is till I watch Gokusen 2 and Dragon Zakura.. 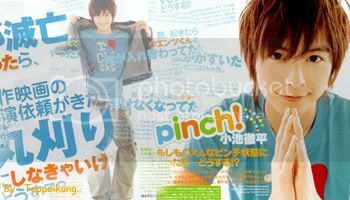 I've also watch his movie..Lovely Complex..
his is way to adorable..
but loved him the most in Dragon Zakura and Gokusen. i loveeeeeeeeeeeeee his hairstyle and funky dressing style. shama129[/] : Pi kawaii ne~! I love to see him in specs actually..He looks more and more smart than usually.. The way he dressed up in Dragon Zakura kinda cute..
yappari we have to share him..
just like we share our dear pi.. He soooooooooooooooooooooooooooo cute!!! Love him in gokusen 2! Though he has some tendecy to look like a girl sometimes. But still, he's a cutie!!! I love Koike's new album!! nela302 wrote: lol it seems like everyone saw him dragon zakura first. he's irrestable there. who wouldn't love him. oh oh! I guess I'm in the minority here~ I first saw Teppei-chan in Water Boys 2. But it wasn't until Gokusen 2 that he really caught my eye with his adorable baby face. yay! I've been wondering what his name is. Now I know. He's really kawaii, he looks so cuddly, like a teddy bear, or a baby...I usually just call him as the guy in Dragon Zakura and Gokusen 2 and as the lead in Lovely Complex...He's a kawaii chibi. One time, I saw him perform in Music Station and he was wearing eye glasses and he was so so so cute. If he could even pass as a girl, sort of like a reverse Hana Kimi. wow this thread isn't moving at all where are all the teppei fans.. come on guys he' soo adorable, lovable. kawaiiiiiiiiiiiiii lol. yah but is her doing anything? hey.. where'd all te-chan's fans go?!! dont you think he's the cutest?!! especially with glasses on..
want more of him.. more dramas pleassssee..
*Otoshidama is a customary little packet of money given at new years. Otoshidama are a saving's standard. that's how you'd tend to spend it, however Koike Teppei is a little different. 08, what will happen & what will happen...!? somewhere," and talked with dad. Then, dad made a plan and got us a reservation to an inn. " Osaka being apart, spending time with family is customary to Koike Teppei. Meeting up with Osaka friends is also customary to Koike Teppei's New Year. something to look forward to every year. i didn't like him in Mada Minu Chichi e, Haha e. this kind of role doesn't suit him. he was much more funnier in LoveCom movie and i think in KIDS he will also play a suitable role fro him, as well. does anyone know if there is a place to watch his new movie KIDS? how is are kawaiii teppei doing??? is KIDS out with subs yet? its a rather heart breaking movie.. but i would really love to check it out. Last edited by wuff on Jun 13th, '08, 08:11, edited 1 time in total. I didn't know these sites, so thank you bvery much!!! I can't wait to see Shibatora. It looks cute. lilswtangel wrote: ^sorry, but shorty still belongs to me! ALL M-I-N-E!! In the morninglight, I'm lookin' for some fun. I steal Teppei, so his for my own. nela302 wrote: he's no one else's shorty but MINES. u looked so cuteeeeeeeeeeeeeee in dragon zakura. love at first sight. do u remember that teppei?it was love at first sight for both of us. demo, doushite mo, watashi wa itsumo ganbarimas! anybody here meet te-kun inperson? made a teppei koike set. wow!ur so great can teach me how can i do that? Im hazelkenro nice to meet you!!! Last edited by hazelkenro on Sep 30th, '08, 19:19, edited 1 time in total. "Looking forward Angel Bank,Yamato Nadeshiku (live series) and CODE BLUE! btw, i just added you and sent you a message on multiply. you have lots of nice pix. i'll use them to make some more graphics. Thanks. I have a ton more I haven't put up yet too, not any from Love*Com though. If you want I've scanned all the pics in the Peices album too, just haven't had time to crop and clean up yet. thanks so much!! i'll make use of them soon. i fell in love with this guy after i watched gokusen 2 and water boys..
and i ddnt even know that he sings.. rofl but he has a nice voice.. I'm looking for a certain picture of him that I lost in my computer crash, so hopefully someone can help me out! It's a picture of him making/eating Okonomiyaki and he was sooo adorable on it! So I absolutely want to have that picture again! And if you have any other pictures of him cooking/baking, please upload them for me as well? I'm fast becoming a fan of Teppei. He's a great actor and a such a little cutie! I really liked him him Gokusen 2 and I loved his performance in KIDS! BTW...does anyone know the title/artist of the ending theme song for KIDS? I've been searching and searching and can't find a shred of info about this movie's OST, and that ending song in particular. It's driving me nutty! first watched him in gokusen and though i liked him there, liked him more than anyone else in fact, i wasn't a fan enough to watch his other shows. oh i researched about him, got to know Wat but he was just one of those cute guys for me. aaaand then years later i got bored and started re-watching dramas. i remembered not finishing dragon zakura before, which i was interested in because i liked teacher dramas, and lo and behold, i had forgotten that teppei was there. from there i started to looked up what his other dramas were and i got curious about iryu. i'm not fond of dramas without comedy so i wasn't sure i'd like it. i had the time though so i tried it and i was honestly surprised that i loved it, even when teppei wasn't in the spotlight. as i finished iryu, i watched his other dramas and movies, watched unfortunately unsubbed variety shows with him and eiji over at tudou and i liked him more and more. because teppei isn't just a pretty face. he's kind and brave (watched a vid of him rapelling and he was such a boss about it lol) and overly polite (he always seems to bow at the waist level no?) and super duper talented. sure his voice isn't as great as most, but he ~can~ sing. and the fact that he composes songs is amazing! and the guitar! i had thought he was average at it, but he really really knows the instrument very well, which is apparent upon watching videos of him playing. and his acting! sure he won't win any awards. and it is unfortunate that he always seems to get the innocent/idealistic/bumbling hero (except in tagatameni which i want to waaaatch and maybe tetsu no hone) but he does his roles well enough that i am convinced that he ~is~ that character and not teppei ~acting~ as that character. he has a charm that i can't explain. and whenever i watch him in variety shows, there is this feeling that i am seeing teppei himself and not a mask he is wearing. his relationship with wentz is wonderful to watch too! i love how even when they're so different, it is apparent that they are important to each other. gotta love 'em bromances hahahaha!! and it's beautiful cause they're subtle about it. a hug here, a hit on the head there, the two of them unable to stop teasing each other. uuuugh, i want to watch more moments like these! with english subs if possible! anyway, i will stop here and i hope to hear others' thoughts about this wonderful person! i am a new member here.. i'm a fan of koike teppei.. in gokusen 2, my favorite character is him as keita takeda not ryu odagiri or hayato yabuki.. in dragon zakura, my favorite character is also him as hideki ogata not yusuke yajima (yamapi)..
koike teppei is so cute.. i have watch 4 movies with him in it.. lovely complex, kids, the homeless student and gokusen the movie.. in fact, i watch kids and the homeless student because of him..